Peerless PLP Dedicated Adaptor Plates offer compatibility for displays with a specific VESA pattern. These adaptor brackets are designed to quickly and easily attach to many Peerless display mounts that incorporate the PLP mounting pattern. Mount your display with confidence knowing the included security hardware will help prevent theft and keep your displays safely mounted. Our PLP Dedicated Adaptor Plates come with included security hardware, which help prevent theft and enhance the protection of your display. 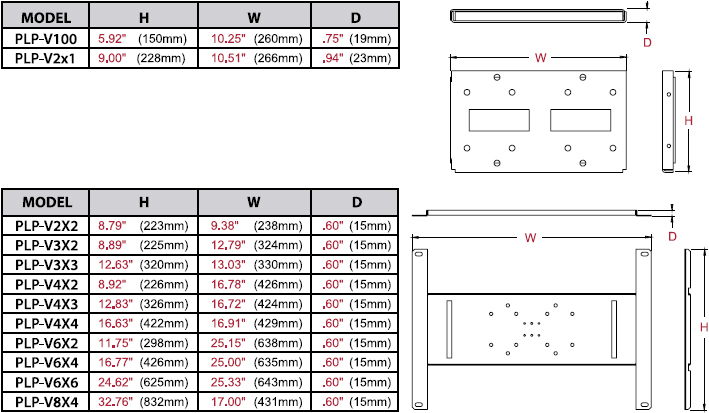 Dimensions PLP-V100: 10.25" x 5.92" x .75", PLP-V2x1: 10.51" x 9" x .94", PLP-V2x2: 9.38" x 8.79" x .6", PLP-V3x2: 12.79" x 8.89" x .6", PLP-V3x3: 13.03" x 12.63" x .6", PLP-V4X2: 16.78" x 8.92" x .6", PLP-V4X3: 16.72" x 12.83" x .6", PLP-V4X4: 16.91" x 16.63" x .6"
Shipping Dimensions PLP-V100: 13.5" x 11.75" x 1.5", PLP-V2x1: 12.75" x 9.5" x 2.5", PLP-V2x2: 12.75" x 9.5" x 2.5" , PLP-V3x2, PLP-V3x3, PLP-V4x2, PLP-V4x3, PLP-V4x4, PLP-V6x2, PLP-V6x4: 29" x 21" x 1.13", PLP-V6x6: 27" x 25.5" x 5.25", PLP-V8X4: 35" x 21" x 1.5"